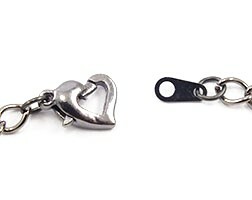 Here’s a guest post from The Bead Shop, the perfect place for anyone looking to stock up on jewellery making equipment. However, if you’d rather use different beads entirely, that’s okay too! 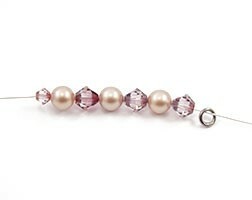 This really is one of those uber-versatile designs that can perfectly incorporate a variety of beads. Next, thread on four more 6mm Pearls and three more 6mm Bicones (alternately) followed by another 4mm Bicone to finish the first loop. 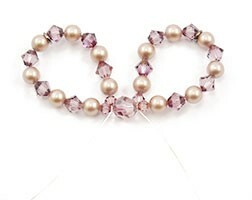 Bring the two ends of the wire together and thread them through an 8mm Swarovski Faceted Round Crystal and pull it tight. Grab the longest piece of wire emerging from the 8mm faceted bead and start creating the second loop in the same way you created the first. Then thread the wire back through the large bead in the centre. You should have one length of wire exiting each side of the bead in the centre. It’s now time to create the bow’s tails. Thread on a 4mm Bicone followed by 3 Pearls and 3 Bicones (alternate between the two). Finally, add an 8mm Faceted Round Bead and secure it in place. Trim off any excess wire. Attach a 5mm jump ring to each end of your chain before attaching it to the jump rings at the top of each loop. 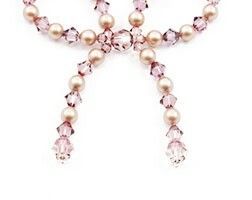 Finally, add a clasp to the end of your necklace so the two ends can be attached. 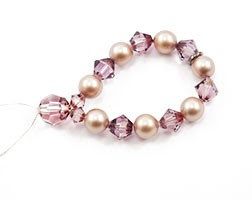 If you’d like to make a matching pair of earrings, make two matching bows using 4mm beads and 0.3mm wire before sticking a flat stud on the back of the centre bead. That's so delicate - especially the earrings. Thanks for sharing.